Ratepayer-funded electric energy efficiency programs designed to reach low-income customers are important tools for states to control electricity costs for all customers and reduce greenhouse gas emissions. These programs reduce electricity bills for low-income residents, making it more feasible for them to pay their electricity bills. Electric utilities with lower bad debt and fewer customers who cannot pay their bills spend less following up on unpaid bills. They can then pass those cost savings on to all ratepayers. Low-income energy efficiency programs often also improve occupant health and safety, which can reduce taxes or prevent tax increases. Taxes include costs to provide emergency medical treatment for low-income residents due to adverse health impacts caused by poorly weatherized homes and fires caused by unsafe homes. These cost savings flow directly back to all taxpayers. 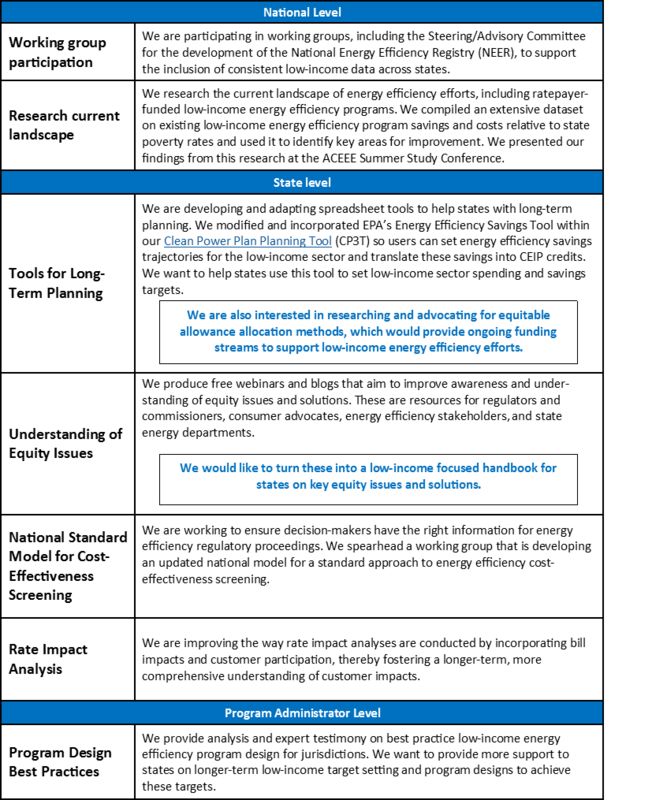 Our research suggests that a large portion of low-income energy efficiency opportunities remain untapped due to underfunding, ineffective program designs, incomplete data, and regulatory barriers. Synapse has been working on all three fronts—the national, state, and utility program administrator levels—to make data more interconnected and transparent, promote policies that address equity issues, and support best practice low-income energy efficiency program designs. If any of our work highlighted below sparks your interest—or if you have ideas for other projects related to low-income energy efficiency—get in touch! Our energy efficiency experts are always open to opportunities to collaborate in these endeavors.